I hope you all had a great holiday weekend. We not only celebrated Easter/April Fools, but also my father’s birthday as well as a kickoff to Spring Break! Even though we are staying in town, the girl and I are hitting up the amusement park a few times this week and in between roller coaster visits she is being my assistant on a few projects. One of the projects we tackled over the weekend was her new blackout roller shades with a fun tassel pull. This was an easy one, but a project that needed to be done out of necessity. At the beginning of the year my seven year old daughter started sleep walking… which was completely out of the ordinary for us as she has always been an excellent sleeper. So while we have been dealing with the sleep walking and creating a more consistent sleep schedule, we realized that her drapery panels let in a little too much light. They had a light filtering liner, but it only blocked about 80% of the light. We have had luck with the Tuppler Blackout Roller Shades from Ikea in other spaces, so we decided to install them in her room as well. The installation process is simple and pretty straightforward. You can install them inside the widow, on the outside of the frame or even on the ceiling. We opted for the inside mount to try and eliminate as much light as possible. 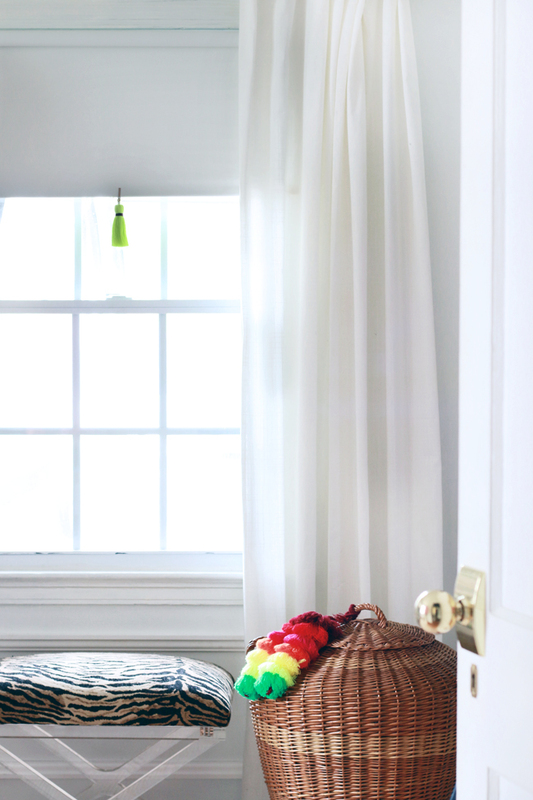 After they were installed, I felt like they needed a little something else… I held up various fabric, ribbon, trim, but decided this neon yellow Junkanoo Tassel from India Hicks was the special touch it needed. It is also functional, acting as the pull for the shade. I used a sharp X-acto knife and created a small slit at the top of the thin wood strip that is at the bottom of the roller shade. I then pushed the leather cord on the tassel through and tied the cords in the back. 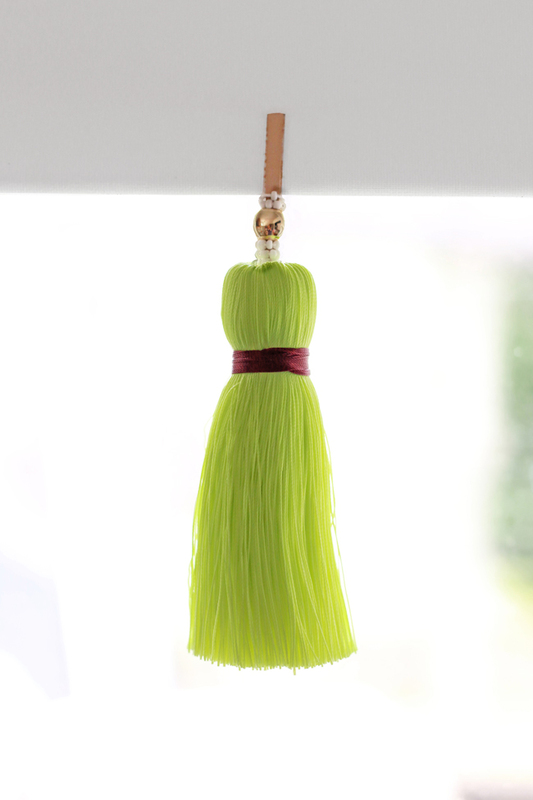 The simplicity of the single tassel actually focuses the attention onto these little beauties. I love the attention to detail that is brought to these tassels. The vibrant contrasting colors, the beading and the leather cording are all fantastic. 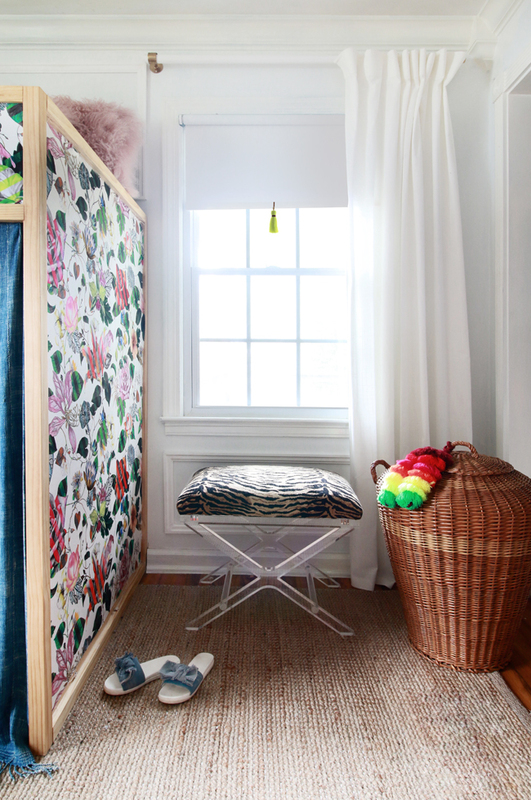 And the color way could not have been better with her floral loft bed I built. I actually couldn’t decide which color I liked best and ordered the Flamingo Junkanoo Tassels as well. 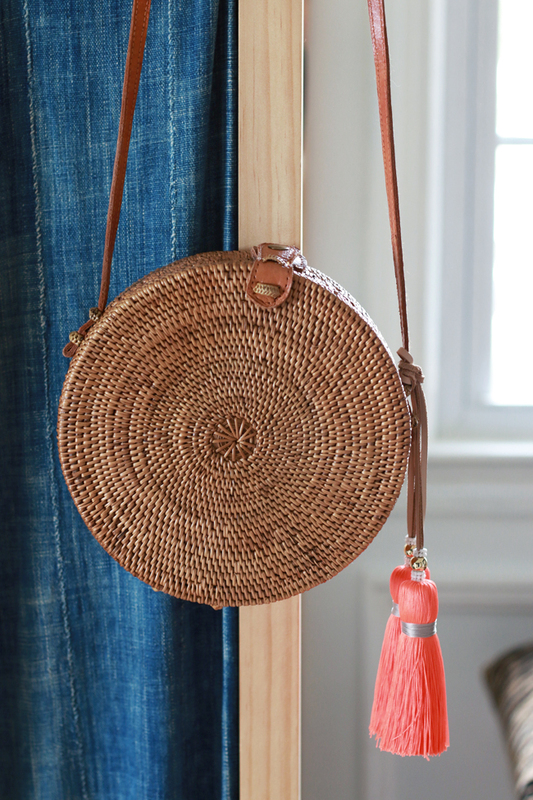 Fun fact… they look great on bags too! This will be my go to for Spring/Summer 2018.